In my years as a Registered Dietitian, there is one thing that the vast majority of my clients have in common: they skip breakfast. I personally wake up in the morning excited to eat breakfast, so I’m always a little mind-blown by people who voluntarily skip this meal. But, I totally get it. People have many different reasons for skipping, but the most popular one is “lack of time” in the morning. It’s hard enough to wake up when the alarm goes off, let alone wake up early enough to make a decent breakfast before rushing out the door for work, class, or whatever it may be. 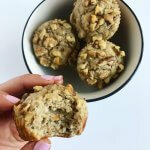 Enter: these Banana Nut Blender Muffins. I think most RDs would agree with me that breakfast is an important meal, but I wouldn’t necessarily say it’s the “most important” meal. I think all meals are important in their own way, but breakfast is unique in that it is an opportunity to set the tone for the rest of the day. I find that starting the day off with a balanced breakfast leaves me feeling satisfied and energized for a productive day ahead. It also makes me want to continue making healthy choices at my next few meals. In addition, I typically work out first thing in the morning, so breakfast is a chance for me to refuel with some quality nutrition post-workout. With all of that being said, breakfast is an important meal, but so are the others! Skipping meals and/or eating too few calories can slow your metabolism and leave you feeling sluggish (not to mention malnourished), which is basically the opposite of what most people are going for. If you skip meals on a regular basis, I would strongly encourage you to do your best to break this habit! If nothing else, try to have a snack every 4-6 hours or so to continually provide your body with energy and nutrients! Honestly, I can’t go a day without eggs. At least I don’t want to. Eggs are definitely my favorite protein source and they are loaded with nutrition, plus they are super versatile! 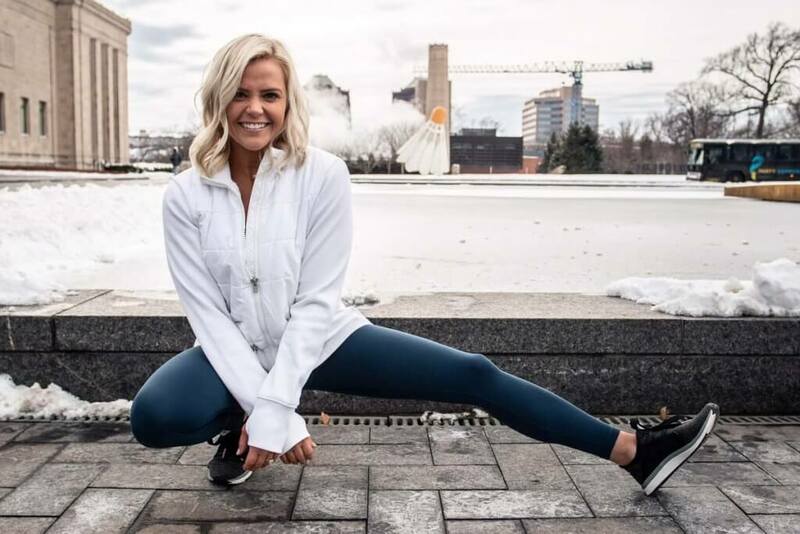 If you’re worried about consuming eggs because of the cholesterol content or any of the negative stuff they are saying about eggs in the media lately, read this article written by fellow RD Abby Langer. Spoiler alert: it’s okay to continue including eggs in your diet on a regular basis. If you have individual concerns, as always, meet with an RD or your physician one-on-one. 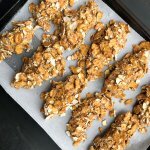 I love pairing eggs (scrambled if I’m at home, hard-boiled if I’m on-the-go or at work) with some kind of homemade baked good, such as my Blueberry Pecan Baked Oatmeal, Healthy Carrot Pumpkin Muffins, Honey Whole Wheat Banana Bread or these Banana Nut Blender Muffins I’m about to share with you! I always top them with crunchy peanut butter or creamy almond butter for extra deliciousness. Nut butter is basically its own food group in my book. Healthy Tip: If I’m cooking up eggs at home, I often throw frozen chopped spinach in the pan to sneak in an extra serving of veggies. Keeping frozen veggies on hand is a great way to increase your intake because they require zero time or effort on your part. Just toss them in wherever you can! Frozen chopped bell peppers and onions are some staples for me for things like Veggie Flatbread Pizzas, and even Sweet Potato Nachos. When it comes to baked goods, I prefer to make my own, as opposed to picking them up at the grocery store or Starbucks drive-through, because a) they are much cheaper this way, and b) I know they are filled with ingredients that make me feel my best and give me lasting energy. The batter is made in the blender, so you only have one dirty dish to clean! They are super versatile. Top them off with any and all of your favorite toppings — dried fruit, nuts and/or dark chocolate — and it’s almost as if you’re having something new each time! I have made them with all of the above toppings, and they are delicious no matter what. My favorite add-in is simply chopped walnuts, which is what I tend to stick with the majority of the time. It adds a delicious crunch, as well as a dose of heart-healthy fats, helping to keep you full and satisfied long after your meal! You’ll definitely want to start making these every weekend to save yourself time on busy weekday mornings! These Banana Nut Blender Muffins make a delicious, healthy, grab & go breakfast, and you will only dirty one dish in the process! They can easily be made gluten-free by using GF oats. Place all ingredients (besides mix-ins) in a blender or food processor: oats, bananas, eggs, Greek yogurt, honey, chia seeds, collagen peptides, cinnamon, baking powder, baking soda, vanilla, and salt. Blend on high for 2-3 minutes, and stop to scrape down the batter from the sides as needed, until batter is smooth and the oats are almost completely broken down. Add mix-ins by hand after blending is complete, or sprinkle on top once the batter is in muffin cups. Divide the batter between the prepared muffin cups, filling them about 3/4 full. Bake for about 15 minutes, or until tops of the muffins set and are golden brown, and a toothpick inserted in the center comes out clean. Let the muffins cool for about 10 minutes before removing from pan, then dig in! -Visit furtherfood.com or Amazon to purchase your own Further Food Collagen! It’s a good source of protein with no fillers or added sugars. Use my code WELLNESSFORTHEWIN for 10% off your purchase and free shipping. -Serving suggestion: serve warm with a dollop of almond butter on top. Pin this recipe on Pinterest so you can easily refer back to it later, and tag me in your creations on Instagram at @wellnessforthewin! Banana and egg items are delicious one. Those are worthy for trying. Thank you!! I hope you like them! The recipe seems to be missing from the page.